Our household has had a difficult time this semester adjusting to me being back at work and the hubby’s schedule readjusting as well. In particular, the little boy of the house has been feeling like he is not getting enough one on one attention. 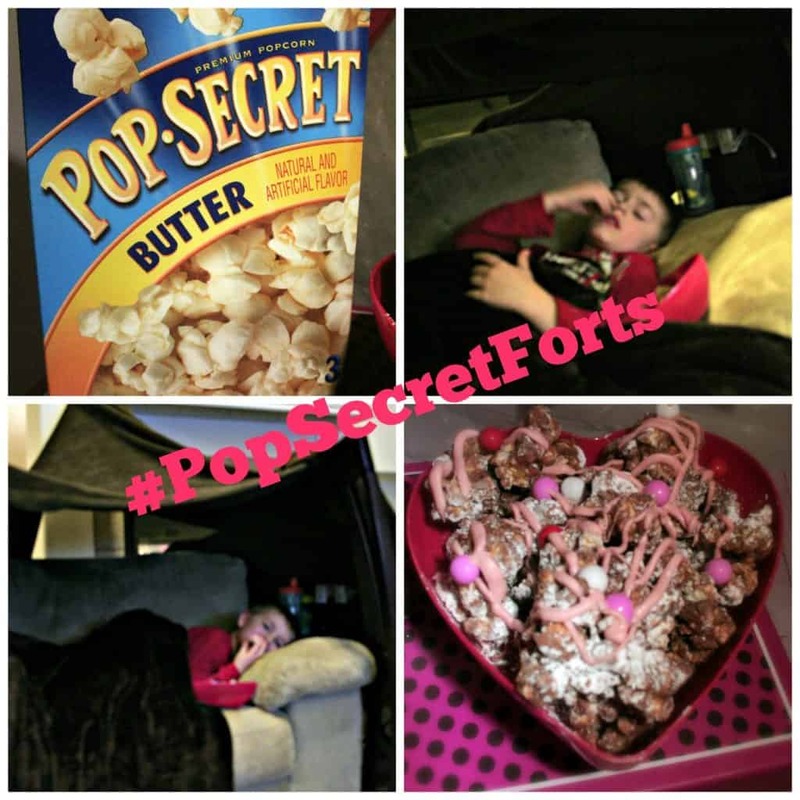 I was elated when Pop Secret contacted me to create a pillow fort and have a family night on them! Eyan’s faces in these pictures crack me up, he would not smile he just wanted to eat that popcorn in his fort! Last night I took the kids to the grocery store to pick out something for dinner and grab our favorite go to popcorn! Eyan chose the butter flavor and little did he know I was going to create something that would make it even more tasty! We went home, cooked some delicious mexican pizza’s and then I put the baby to bed and had Eyan go take a bath. 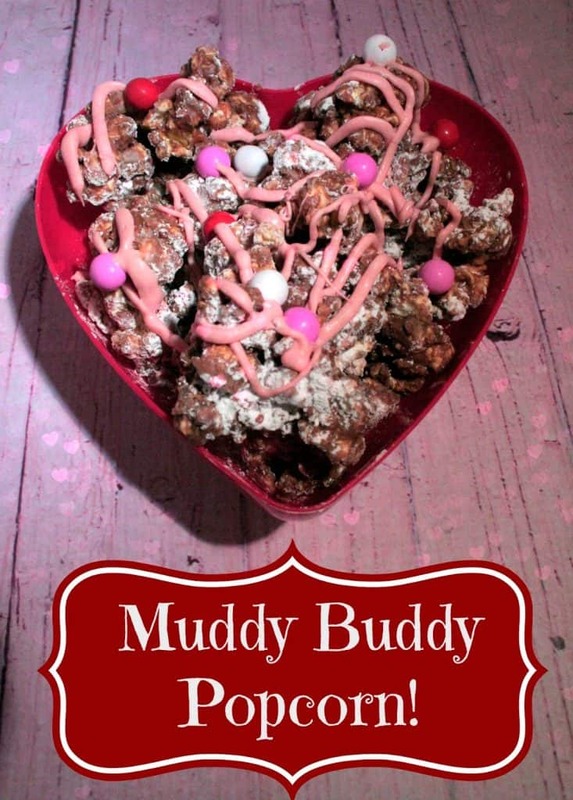 While he was in the bath, I went to work, making the delicious muddy buddy popcorn and building a fort. When he came down, he was so excited! He picked a movie off Netflix and climbed right in. He didn’t want me to really take photos, he just wanted me to snuggle, so naturally I jumped at the opportunity because I know these moments are few and far between. It was a great night to spend with just me and my little guy with a great snack. I hope that this helped him feel valued and special as I know the adjustment of me heading back to work each semester is a tough one on both of my kids. Last week the poor guy was overshadowed by the not sleeping princess. We had a great night thanks to Pop Secret building out pillow fort! Pop Secret is making it easy to have a family fort night as well by offering a $1.00 off coupon and an adorable flag option to add to your fort! Pop Secret is your perfect snack companion on trips into the uncharted reaches of your imagination. 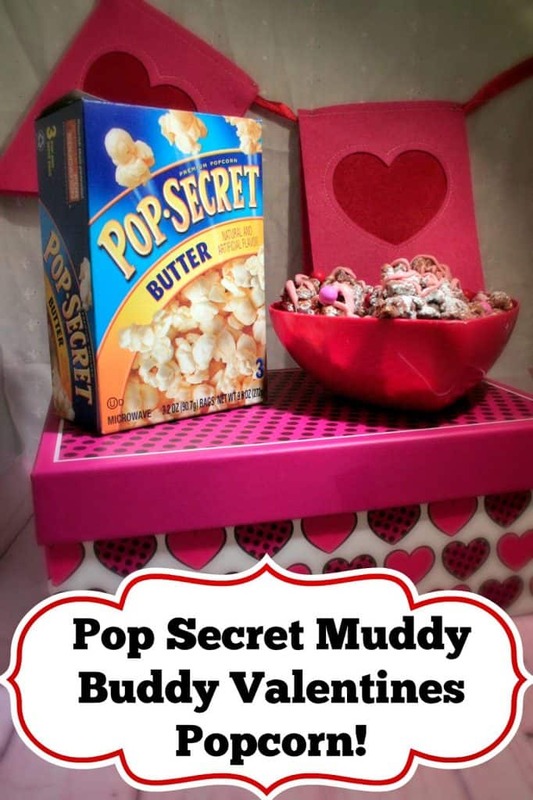 Pop Secret knows that fun, like popcorn, is better when it’s shared. Send Pop Secret your pillow fort stories and pictures on Facebook. You can upload them right to the Pop Secret timeline and tag them #PopSecretForts. They might just share a little something back! 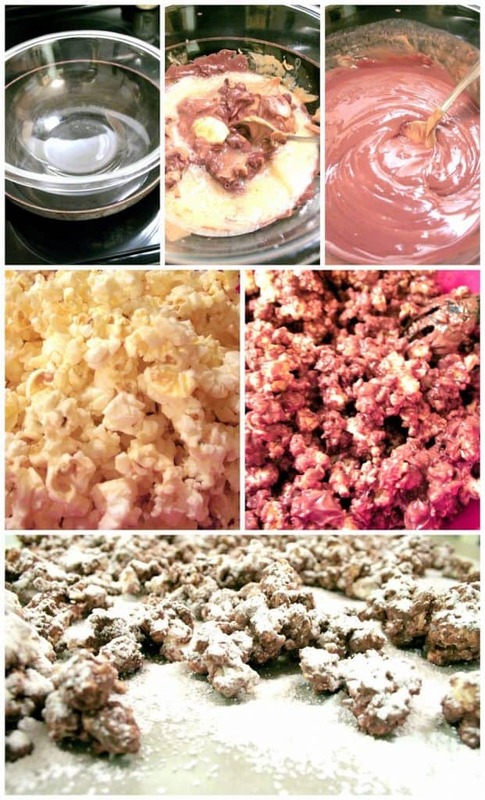 Now for the most amazing popcorn recipe ever, just in time for Valentines Day! Pop the bag of Pop Secret popcorn in pour in a large mixing bowl. While the popcorn is in the microwave, put about 1/4 inch of water in a pan on the stove and then place a HEAT SAFE glass bowl in the water (pyrex works great). Turn the stove on to a low-medium heat and allow the water to simmer (NOT BOIL). Place the chocolate chips, peanut butter and softened stick of butter into the glass bowl on the stove and mix until it is melted. If you do this correctly the chocolate mixture melts but does not get scalding hot. After your chocolate mix is melted (i.e. : Muddy!!! ), pour it over the popcorn and then use a large spoon to mix the popcorn and “muddy mix” until all pieces of popcorn are fairly evenly coated. Lay out some wax paper and then spread out your “muddy” popcorn making sure to break up large chunks. Allow to air dry for 10-15 minutes. Eat, Love, Eat, Thank me for your pure and utter love of this amazingness! Don’t forget about the awesome coupon and printable banners that Pop Secret is offering on their Facebook page! So many mystery prizes out there for you to win, so why not enjoy a family night with some deliciousness and make those memories. Disclosure: This article is sponsored by Pop Secret however, all thoughts, opinions and ideas are mine.